A sharp knife is a chefs best friend. However, sometimes you need more than just a sharp knife. Your kitchen scissors, Santoku, pocket knives, or serrated knives could use a good sharpening too. Unfortunately, there are very few knife sharpeners that cater to a variety of knives, and as you know, buying a number of products for the same purpose can be a waste of money and pretty annoying. Luckily, there is one knife sharpener that seems to do it all. 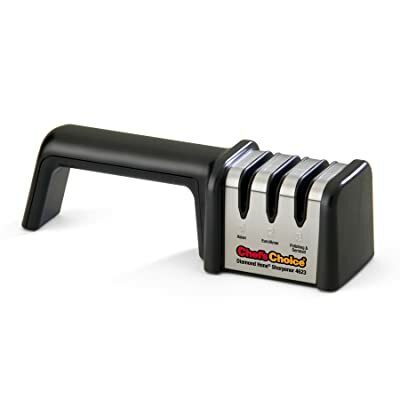 The Chefs Choice 4623 Hone 3-Stage Manual Sharpener is the product for all your blade sharpening needs. Below you will find a few of the product so you have an idea of exactly what it is capable of doing. While this knife sharpener is not made by a German company like most outstanding knife sharpening products, it is still produced by a high quality American company located in Pennsylvania. This product is manufactured by Chefs Choice, which has been churning out reliable and top-notch products since the 1980s. This knife sharpener is a 3-stage manual knife sharpener. The first two stages of the knife sharpener are separated by Asian and American/Euro, which are used for either knives that originate in Asia or in the Americans. This dual option allows you to use the right sharpening tools for any given knife. The third stage is for polishing and serrated knives. Each of the three stages is equipped with 100% diamond abrasives so your knife is sharped perfectly and receives a stellar finish. The manual sharpening feature of this product allows you to switch between 15 and 20 degree edges for precision. In terms of features, this sharpener is equipped with many. First and foremost, the best feature of this product is that you can use it on an array of different knives. This truly takes away the hassle of needing to buy separate sharpeners for different knives. In addition, there are separate sharpening and honing stages so you can get the right edge on your knife that will stay sharp for a long period of time. Most knife sharpeners are made with different types of stone, and this particular product truly goes all out. Each sharpening stage uses diamond abrasives, which are known to provide knives with extremely sharp and exact blades. Lastly, the design of the product is a bit different than other manual knife sharpeners, as it has an ergonomic handle that can be used by the left or right hand. The product sits stably on your countertop as you simply glide the blades through the compact slits. The price of the product is very reasonable compared to other quality knife sharpeners. In sum, this product is excellent if you are looking for a sharpener that can sharpen a number of different blades to near perfection. This sharpener should mainly be used for traditional kitchen knives or blades. However, you should also be aware that if your intent is to sharpen extremely large kitchen lives or steak knives, this product may not serve you very well. In addition, some blades have been known to become scratched by the plastic during sharpening.